There has been a flurry of activity on the awards front this week, with three of our projects receiving accolades. Firstly, we are delighted to announce that Matchmakers Wharf has been shortlisted for a staggering four awards: Development of the Year at the RESI Awards, Housing Project of the Year at the Building Awards, Best Regeneration Scheme at the Housing Excellence Awards and in the Residential category of the RICS Awards. 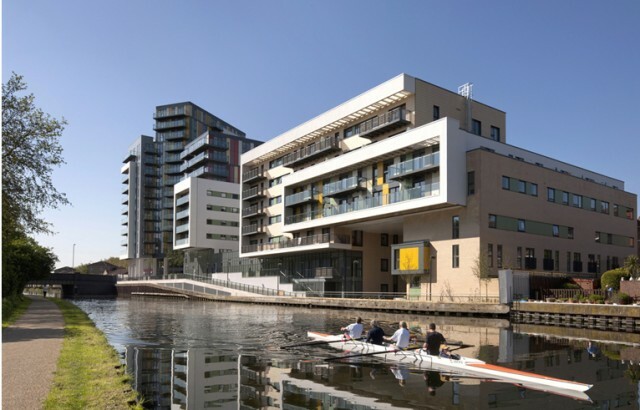 Developed by Telford Homes and L&Q, the scheme provides 209 new homes, commercial space and artists’ studios in a landmark waterfront development in Homerton. At the First Time Buyer Awards, Olympus Apartments has been shortlisted in the Best Architectural Design category. Located in the heart of Bow and on the site of a former metalworks factory, the development offers 61 new homes in a mix of affordable tenures. Oberon Court is also shortlisted in the Most Eco-Aware Project category of the First Time Buyer Awards. The 42 home scheme was the first in the London Borough of Newham to achieve a Code for Sustainable Homes Level 5.